I want to wish you a Happy Thanksgiving and to say thank you for allowing me to be part of your life. I pray God’s favor on your Thanksgiving, whether you are gathering with a crowd or spending the day on your own. Whatever the case, your giving of thanks will bless the Lord. 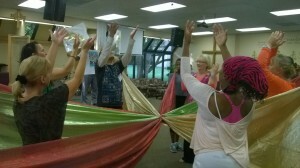 The word, “Yadah” in Hebrew, which is translated as to praise or to thank in our English bibles, is to hold out, to revere or worship w /extended flourishing, wave hands in showy way, graceful gestures, glorify, give thanks, cast out, use the hands in a motion of throwing, cast out, use hands in motion of throwing. (Taken from Dance, Dance, Dance! by Lynn Hayden.) The scriptures are full of calls to give yadah or thanks to God. 2 Chronicles 20:21, Psalm 107:15 and Psalm 63:1 are just three of many. 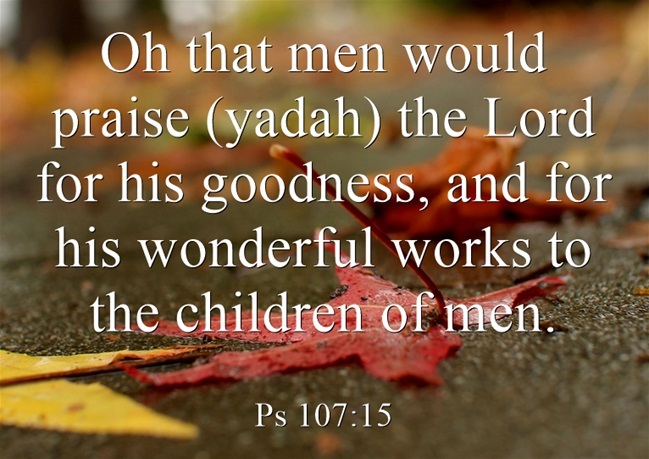 So, today, as you are giving thanks, take time to lift up your hands in thanks, wave them to the Lord as a sign of your appreciation for His goodness in your life. You’ll give Him joy and, I’m pretty sure, find that you, too, are edified. That’s just the way it works with Him. You can’t out give Him. 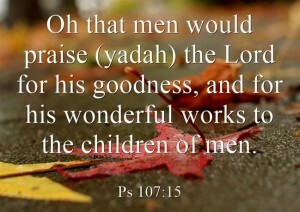 Have a thankful, and Yadah-full, Thanksgiving. Next Next post: How are you doing with the holiday busyness?